WISE Conference Centre at Centre For Alternative Technology01654 704973work Conference CentreWISE has impressive facilities that can deliver successful conferences, in memorable spaces. 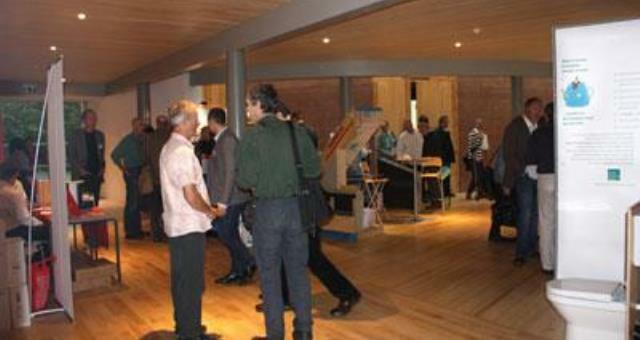 The Sheppard Theatre comfortably holds 180 delegates within its circular, rammed earth walls and has an adjoining exhibition/reception space, overlooking the tranquil courtyard garden – you are never far from nature and natural light in WISE. Catering requirements can be met in equally stunning spaces and all of this is complemented by state-of-the-art audio visual facilities, which will ensure a professional appearance for your conference. In addition WISE offers a number of beautiful rooms ideal for meetings, workshops and training sessions. The Brook Trust Room affords an inspirational view of the hills of southern Snowdonia and an ambience to help inspire creative thinking. 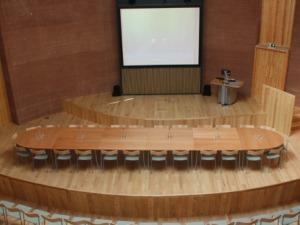 The Wales Institute for Sustainable Education is a unique venue. WISE is the most beautiful combination of environmentally conscious design and cutting-edge sustainable building techniques. The venue is sensitively constructed out of low embodied energy materials such as hemp and lime, rammed earth and sustainably sourced timber. Situated in the stunning landscape of mid Wales overlooking the scenic hills of Southern Snowdonia, WISE is located in the grounds of the Centre for Alternative Technology, one of Europe’s foremost eco-centres with over 35 years of research and experience in sustainable living. CAT’s seven acres of displays and organic gardens offer a wonderful, stimulating atmosphere for any event. WISE has impressive facilities that can deliver successful conferences, in memorable spaces. WISE has impressive facilities that can deliver successful conferences, meetings, training sessions or one-off events. If you are looking to measure the success of your event by prioritising its sustainability credentials, then WISE is the venue for you. Assisted Access, Coach Access. Group Rates available. Special offers for visitors arriving by train, bus, bike or foot. This package includes day hire of the Sheppard Theatre, morning and afternoon refreshments, and buffet lunch in the WISE restaurant. This package includes day hire of a meeting room, morning and afternoon refreshments and lunch. The Centre for Alternative technology is ideally situated right in the heart of Mid Wales, just two hours by train from Birmingham International Airport and Train Station. CAT is located three miles north of Machynlleth on the A487, look out for the brown signs. Bus services run from Machynlleth and other major towns. The T2 runs regular routes from Aberystwyth to Bangor. The T2 also passes the centre as well. It's worth looking online if you're planning to travel by bus and ask the driver about the best place to alight for the centre. National Cycle Network Route 8 passes via CAT's entrance and the road from Mach to CAT is quiet and safe (see map above). Free car parking at Visitor Centre. EV Car Charging point: Free to Cat Visitors - notify reception on arrival and they will assist you with the charging facilities. There is disabled parking at the top of both driveways. Please don't hesitate to call us on 01654 705989 for more information.